On a brand new hull you may have a waterline mark. On a hull you have rubbed down, you may have lost some or all of the original waterline marking. 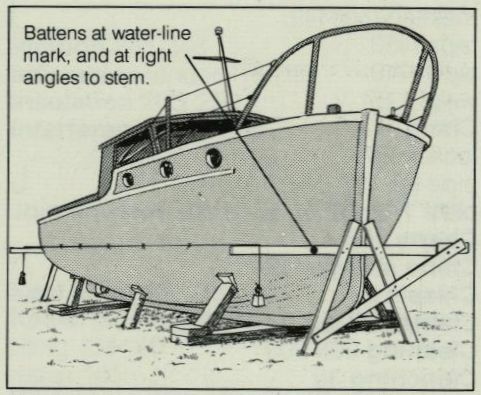 I came across a very neat idea for marking the waterline on a boat that is out of the water – as long as you know the waterline point at bow and stern. The drawing above came from the remains of a very old book I found in a sale – you can tell from the boat design how old the book probably was! As you can see from the drawing, you need to set up two horizontal beams on a rigid trestle. Horizontal if the boat is sitting true, or angled to align with the boat orientation if it isn’t quite! The height of each beam at the bow and stern needs to be at the waterline. You then need two weighted cords hanging over each beam, kept taught. Move the cord along the beam until it just touches the hull along the waterline. Move each end of the cord along its beam to create a number of touch points and you will have a nice straight waterline. Don’t try and wrap the cord around the boat, just make the cord kiss the hull and mark each point. If you need a long flexible ruler to join up the dots, use a strip of cheap flat plastic electrical conduit. I picked up a 3 metre length at B&Q for 90p.